Every year at Yellowstone National Park it’s not only the wildlife that attracts attention, but stupid tourists. Sometimes the things you see from tourists are more shocking than what mother nature has to offer. In the latest episode caught on camera, a woman actually pets a bison. 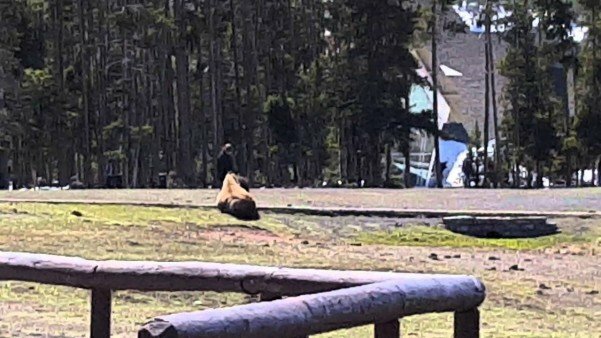 That’s right, she walked right up next to a bison near the a visitor’s center and gentled stroked behind its neck like it was a pet while it appeared her boyfriend filmed the encounter. Maybe it was for the next episode of How to Get Yourself Killed by a Bison. A group of gawkers filming the scene were astonished. “Oh my gosh, she’s petting it,” a man is heard saying. “God is she stupid.. she’s totally antagonizing it. Where are the rangers?” a woman later asks. While they seem benign, bison can actually be quite dangerous, accounting for more visitor injuries than any other animal in the park. Last year the park saw five incidents, some of them severe. Smartphones and selfies they said were largely to blame.